American cities suffer from outdated infrastructure that inhibits the local economy and quality of life. Those cities that can evolve to meet the needs of the information age will be the ones to prosper immensely in the next 10-20 years. When surveying the American city of the past 60 years, it's been understood many times over that our nation's industrial age, mass-produced suburban infrastructure has systematically disconnected us physically and socially. This separation of live, work, and play has led to the well-documented ills of sprawl, traffic congestion, declining levels of community participation; abandoned investment in urban neighborhoods, and an increased separation between race and class. The outlook isn't expected to change as long as this outdated system is still the dominant infrastructure for city building. However, within the last decade alone America has seen an unprecedented 'punctuated equilibrium' shift from the industrial age to the information age. The economy is evolving from an industrial one into a media-based one, with 'media' being defined as 'the main means of mass communication' (i.e. wireless high-speed internet, cell phones, and satellites.) This economic evolution requires a complementary information-age infrastructure to support it, and the governments that are first and best at accommodating this trend will eventually become the next generation of great American cities. First of all, what constitutes a media-based economy? An economy based on media, mass communication and services over mass-produced goods no longer requires large, centralized companies. 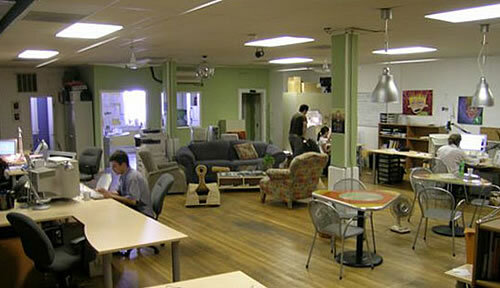 Instead, it flourishes amid a decentralized network of small businesses and entrepreneurs. For instance, General Motors is located primarily in Detroit with factories in a few rural communities, while IBM has a presence in every major city in the country. Information-based companies are also free to locate wherever they want, and thus company leaders will locate offices in cities with the highest quality of life instead of, say, proximity to shipping routes. Also, more workers can be productive from home, whether as employees or entrepreneurs; the speed of change, flexibility and variety of an information-based economy allows unprecedented opportunity for independent contractors. As for the workforce, because they are no longer tied to a single, large company in an industrial district or even an office park, the isolation of the complementary suburbs no longer appeals to them, especially for those without kids. An emerging trend of flight from the suburbs is even more apparent given Census demographics where only one out of every ten net new households will consist of a couple with children. Cookie cutter subdivisions also do not appeal to a consumer group now firmly ingrained in a technology-enabled mass-customization mindset in the age of individualized Mini Coopers, custom-fit Levi's, and personalized M&Ms. Rather, this emerging demographic now demands a lifestyle that prioritizes connectivity and choice over isolation and homogeneity. The core of this emerging workforce can also be described as the 'creative class'; the 38 million representing science, engineering, architecture, design, education, arts, music and entertainment that economist Richard Florida's research concluded is the basis for modern economic growth. Why is a media economy infrastructure necessary? This decentralized network of media-based companies and entrepreneurs requires a media-based infrastructure to support it. As companies decentralize across the country, they are free to centralize in metropolitan areas to be closer to their employees, customers, and partners. The Brookings Institution recently published a study documenting such a downtown population migration based on Census trends in 44 selected cities from 1970 to 2000. Company leaders not bound by the transportation requirements of a mass production company will choose cities that offer themselves and their employees the highest quality of life. While this explains the migration of jobs to states with sunnier weather, it also shows that for northern cities to remain competitive they need to be even more focused on implementing an infrastructure conducive to a thriving media economy. Companies and individuals are also free to locate within clusters of complementary companies in the industry, such as with high tech in Silicon Valley and Austin, or fashion and advertising in Manhattan. However, one of the most significant impacts is to city centers, where basic logic holds that a company or entrepreneur will have the greatest proximity to the greatest number of workers and business opportunities, and the best of them. What are the key components of a media economy infrastructure a city needs to compete? An economy is based on transactions and relationships. In the media economy, these can now be enabled via virtual connections, primarily through the internet. However, the age-old belief that the internet is diminishing our need for face-to-face relationships contradicts the fact that people are moving toward rather than away from areas where more face-to-face encounters are inevitable, such as downtowns and central cities. For instance, email alone has enabled businesses to initiate hundreds of relationships with people simultaneously rather than one by one. Individual entrepreneurs and corporations are simply using the heightened ability to communicate virtually as a means of growing their business relationships, which is increasing the need for more face-to-face, physical interaction. Thus, cities need to expand their media economy infrastructure from both a virtual and a physical point of view. Virtual infrastructure:Companies and individuals need a variety of ways to connect virtually to grow their business, and that means establishing digital networks that are fast and reliable. San Diego's government is taking the lead by offering free wi-fi throughout the entire city, even on the beach. It's no coincidence that San Diego is also one of the leaders in job growth, as fast-growth companies (gazelles) are on the forefront of innovation, and they tend to take advantage of, if not demand, likewise technological support. As mentioned, contemporary workers are no longer tied to the desk and will gravitate not only to cities, but to neighborhoods, buildings and venues where they feel the most productive. At the very least, the downtown should have a free wireless network -- which Athens, Georgia, pioneered several years ago -- as well as an extensive fiber optic network to provide the backbone for more heavy-duty digital networking. 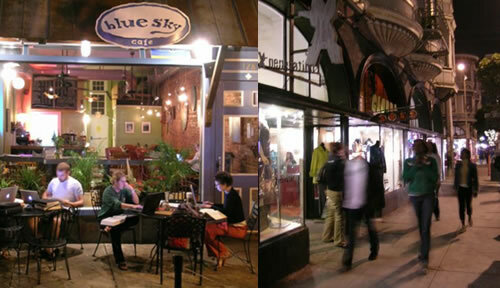 Left: The contemporary workplace for entrepreneurs, Athens, Georgia. Right: The diversity of stores and people in the Upper Haight in San Francisco. Transportation: Here's the bright side of the shift from industry to knowledge in our economy –- although we are losing manufacturing jobs overseas, they are being replaced by media-based jobs that do not require an intense road and highway network. 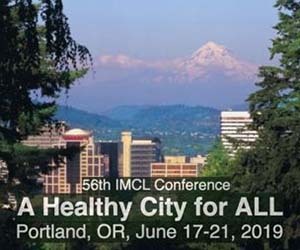 Accordingly, American cities such as Milwaukee, Boston, Portland, and San Francisco have torn down inner city highways and are replacing them with mixed-use, pedestrian friendly environments that reconnect their urban fabric and create locations where the media economy thrives. Such projects assert that the fundamental purpose of transportation is to provide accessibility to real destinations, and not just mobility through them. As for cities overseas that are inheriting the manufacturing economy, many have the densities and a mass transit mindset to better avoid the traffic congestion that is inherent to our auto-dependent culture. In the digital economy, the ideal rule of transportation now applies where the quickest path between points A and B is when they are both in the same spot. Neighborhoods & Districts: Much of this follows the now-familiar New Urbanism and Smart Growth principles of walkable, mixed-use community planning. Basically, the argument is that because there's no longer a prevailing need for an auto-based transportation network, cities that embrace the media-based economy will need to plan for pedestrian, bicycle, and mass transit networks -- the New Urbanism calling card. 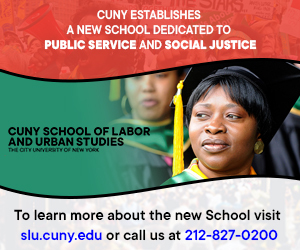 The Department of Labor concluded that 70% of what we learn about our job comes informally, especially for knowledge-based jobs. So, as far as a productive economy is concerned, it's paramount to create a built environment that induces social interaction when not at the workplace. That means an abundance of public gathering places, dining and entertainment districts near home and work. Third places: If you look closely, every 'cool' urban neighborhood has a "third place" -- one that is outside of the home or workplace where people of all persuasions choose to congregate for various reasons. For some it may be a certain pocket park, a neighborhood diner, a church, or even a corner store. For the purveyors of the media economy it is typically coffeehouses, bars, cafes or some combination thereof. On the TV show Ally McBeal, the lawyers discussed much of their most intimate business issues in the neighborhood pub on the ground floor of their office building. It's a representation of reality, not fiction. The same thing happens at the shared entrepreneurial work center where the Cool Town Studios office is locted, where the most ambitious business ideas get exchanged over a happy hour glass of beer or wine. Third places are the favorite, trusted destinations for social interaction outside of the home and workplace. Without them, many of the best ideas in a knowledge-based economy never see the light of day. 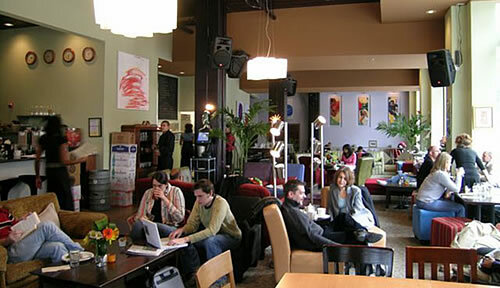 Third places also need free wi-fi to connect people both face-to-face and virtually, like Tryst and Busboys & Poets in Washington DC, and the Flying Star Café in Albuquerque. Finally, college and graduate students flock to third places, and expect to be able to do so upon graduation. Thus, it should be no surprise that cities with vital urban neighborhoods and great third places, like Brooklyn and Austin, are attracting the 'creative class' and have positioned themselves as leaders in the media economy. A coffeehouse-lounge-bookstore-theater 'third place' in Washington, D.C.
What can cities actively do to support a media economy-based infrastructure? First, it's important for cities to recognize that they can't count on the private sector to plan the construction of any kind of comprehensive infrastructure. Second, it's just as critical for cities to realize that it is indeed the private sector's role to build that infrastructure, and even more so, to allow them to collectively concentrate their resources one neighborhood or district at a time rather than piecemeal throughout the city. By taking six key steps, cities can provide the infrastructure necessary for a media-based economy. 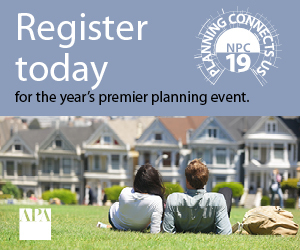 Identify the best neighborhood or district for infrastructure investment. The City of Austin is investing in a plan to focus investment primarily in their downtown. The City of San Francisco is focusing much of their attention for new development in the Mission Bay district, including a new university campus. The City of Lowell, Massachusetts, recently designated a strategic 15-acre site in the downtown. 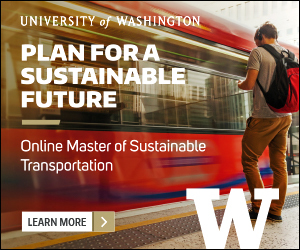 Plan the neighborhood/district transportation around mass transit and pedestrian traffic. Implement appropriate zoning codes -- such as the Smart Code -- that prioritize people over cars. Designate public places to draw outside visitors, increasing the level of social interaction among the knowledge-based workforce. Remember, the productivity of such a workforce is proportional to the number and diversity of people it interacts with. Ideally, this would be a public piazza or square surrounded by independent restaurants with outdoor seating, offices above, and loft residences above those. When designed well, this can also be achieved with paseos (narrow pedestrian-only alleys) or pedestrian-only streets, which have been essential to the economic success of downtowns in the rather progressive cities of Pasadena, California, Burlington, Vermont, Boulder, Colorado, and Charlottesville, Virginia, to name just a few. While parks are an asset, they aren't nearly as effective as these hard-scaped public gathering places simply because parks aren't designed for commercial traffic. Incentivize higher-density, mixed-use building development without a debilitating demand for parking. The City of West Palm Beach identifies specific sites and blocks it wants to see developed, providing new street improvements and density bonuses. Car parking need not be a right, just a privilege. There are countless buildings in pedestrian-oriented neighborhoods of major cities that have zero parking, and those are the very areas that are witnessing the most significant rises in property value. Recognize the economic value of independent retail districts and use incentives that encourage developers to tenant them. There are numerous studies (see the Institute for Local Self-Reliance) that document the economic value of independents vs. chains. One such study noted that Maine's government would lose $23 million if chains captured all retail growth in the next four years, and another study showed that for every dollar spent, 70% more stays in the local economy with independents rather than chains. Private sector developers do not benefit from these figures, only cities do. Therefore, it is up to the municipality to incentivize the private sector into attracting independent vs. chain businesses through its economic development department. One of the most effective tools would be to provide ongoing assistance in identifying and securing independent business tenants as well as providing lease guarantees to the developers. Otherwise, the predictability, higher rents, relative ease, and simplicity of leasing to chains make an overwhelming business case for developers to favor them over independents. Highly successful independent-business main streets include those in downtown Boulder, Colorado, Burlington, Vermont, Madison, Wisconsin, Charlottesville, Virginia, and throughout Washington DC, Manhattan, Brooklyn and San Francisco. Establish a comprehensive city-wide low-cost or free wi-fi network, as pioneered in downtown San Diego, Philadelphia, Athens, Georgia, and Alexandria, Virginia. 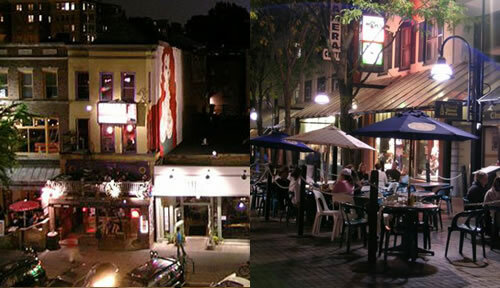 Left: Offices, coffeehouse, restaurant, bar, lounge, diner, and lofts in Adams Morgan (Washington, D.C.) Right: Burlington, Vermont's popular pedestrian-only street, even on chilly weekday nights. Understanding the principles of the media economy and executing on the key steps to building its infrastructure will lead to economic growth for your city. However, this does not only mean merely embracing high-speed wi-fi (virtual connectivity), walkable neighborhoods (physical connectivity), and a variety of housing, transportation, shopping and entertainment choices, but actually integrating all of them in an organic way that is authentic to the eyes of the consumer. This is why so many people find cities like Seattle, San Francisco, and Manhattan so irresistibly appealing (based on their real estate values) -– and why those cities are so economically successful. If cities expect to effectively attract the creative class and its entrepreneurial job-creating leaders, then the creative class needs to be actively sought after and intrinsically included in the planning, design, development, and maintenance process. As the shift from an industrial economy to a media-based one continues, the demand for connected, place-based communities will continue to grow and prosper. We've all but outsourced agriculture, and we've moved on. We've long been outsourcing our goods, and we're moving on. We're starting to outsource our services, and there's widespread concern. The solution is not to try to hold on to what we'll inevitably lose, but to invest into what we'll inevitably gain, which is an economy based on knowledge, innovation and ingenuity. Cities that don't invest in the infrastructure to accommodate this progression will witness a detrimental outsourcing of their jobs and job-creating population. Those that do will become the next great American cities. Neil Takemoto is the Founding Director of CoolTown Studios. His work for over the last ten years has been clearly focused on the implementation of next-generation towns for entreprenurially creative people. 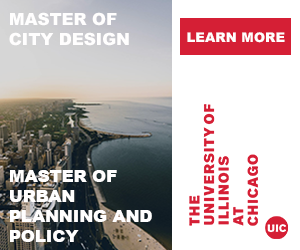 Mike Lydon is a Planetizen correspondent and a Masters Candidate at the Taubman College of Architecture & Urban Planning at the University of Michigan.